You'll notice a massive gap between that last post and this one...yes, my good intentions fell by the wayside. The last twelve months have been a rollercoaster with studying, family, illness and well, general hedonistic eating. It seems that life got in the way...a little at first. But, I soon used it as an excuse to fall back into a more dangerous eating cycle. Rather than get back to the point counting that served me so well, I've foolishly toyed with 'lose weight quick' schemes...and seen the weight creep back on. From taking apple cider vinegar (ghastly) to living a low carb life - it seems I have tried it all. With each venture a new half stone seems to have appeared despite losing as much as 8lbs in a week. However, it hasn't all been bad...My attempt at giving up smoking fell astray after 3 weeks due to weight gain (2 stone!) - but I am still working on freeing myself from it for good. One thing I have rid myself of completely is caffeinated diet soft drinks. Loaded with aspartame, they left me feeling tired and anxious. It has been three weeks now and I feel a million times better for it and it has left me feeling like I can conquer anything. The weight and the cigs being the top of that list. Last Tuesday I had my first weigh-in. My current weight is 15 stone 2 or 212lbs. Oddly enough, I can still fit into the size 16 clothes which I splashed out on last year when I was some 2 stone lighter. But, I won't lie - they are damned tight! Unfortunately, my measuring tape has gone walkies so I have no idea how many inches I have added onto my frame....and right now I'm not so sure that is a good idea. Although this break has seen me gain some of my loss, it has helped me recognise that WW is the way forward as well as realise mistakes I have made. One of my biggest hurdles over the past 18 months has been the threat of the scales....they can become all-consuming even for the most disciplined of dieters. For the next few months my scales shall lay dormant. To ensure I don't fall back into this vicious weighing cycle I have hidden them away without the necessary batteries. It won't be easy - but I will get there. 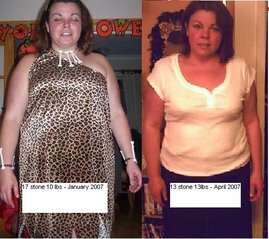 I might have regained but at least I know that I am still 36lbs lighter than I was when this journey began in January 2007.